Human height is the distance from the bottom of the feet to the top of the head in ahuman body, standing erect. It is measured using astadiometer, usually in centimetres when using themetric system,or feet and inches when using theimperial system. When populations share genetic background and environmental factors, average height is frequently characteristic within the group. 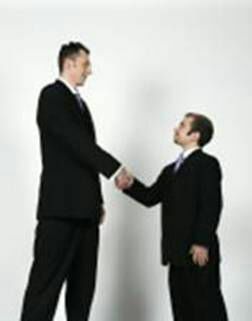 Exceptional height variation (around 20% deviation from average) within such a population is sometimes due to gigantism or dwarfism, which are medical conditions caused by specific genes or endocrine abnormalities. In regions of poverty or warfare, environmental factors like chronic malnutrition during childhood or adolescence may result in delayed growth and/or marked reductions in adult stature even without the presence of any of these medical conditions.